The MOST befuddling comet in modern times continues to amaze astronomers in its behavior. Yesterday, reports were coming in that Comet ISON was dead and gone. Then it had a debris field/tail that was coming out of its closest approach to the Sun. Today, NASA and others are stating that SOMETHING of the comet has survived. Perhaps it is a much smaller nucleus that is causing the comet to start behaving like, well, a comet! 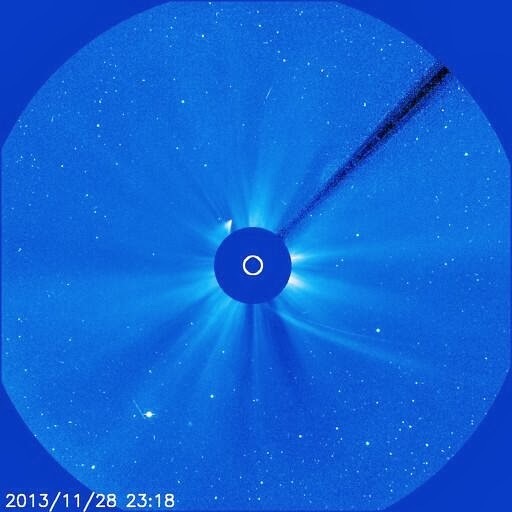 As can be seen in this pic below, Comet ISON has what appears to be a coma and tail. What I have not seen from anyone yet is what will the comet mean to the viewing public. Will it be visible to the unaided eye? I will continue to monitor the latest reports and advise whether we will be able to see the comet in our morning skies. Comet ISON has left the astronomical community in tatters - "its dead, its gone, its coming back, something is left", conflicting views everywhere. No matter what happens I cannot remember a comet causing so much rabble rousing on the 'net. One thing seems clear - the comet suffered some disruption going so close to the Sun....it is not as active and bright coming out as it was going in. The biggest question of course is what does it mean for viewing in the morning sky? The jury is out on this but I do not think Comet ISON has much left to draw upon to light up the sky. I think it will be hard pressed to make naked eye visibility......hope I am wrong. Well, Comet ISON, are you pulling another rabbit out of your hat such as "back from the dead and gone?????? As much as I wish it could be - just don't see the comet becoming a naked eye sight in the morning sky next week. But a cosmic miracle is always a possibility. Monitoring the 'net and the expert consensus is that the Sun destroyed the solid core of the comet - the nucleus. What we are seeing is debris. In looking at the photos I am VERY confident that there will be NO sky display for us in the morning....just not enough there. UPDATED There MAY BE A Bit Of Comet ISON Left! Maybe a last surprise/gasp from Comet ISON? Labels: UPDATED There MAY BE A Bit Of Comet ISON Left! 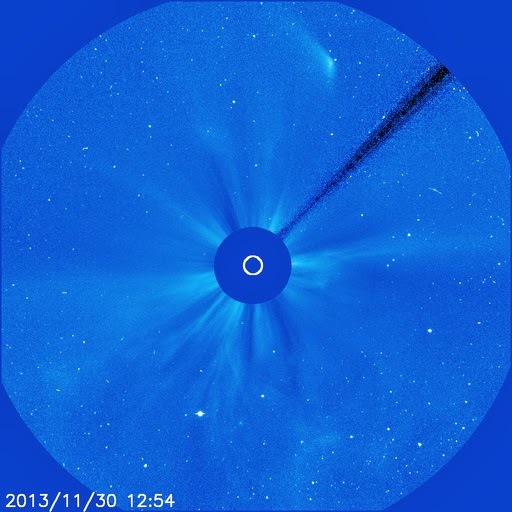 At least one expert is saying ISON is gone and the NASA SDO team "does not see the comet in SDO images". 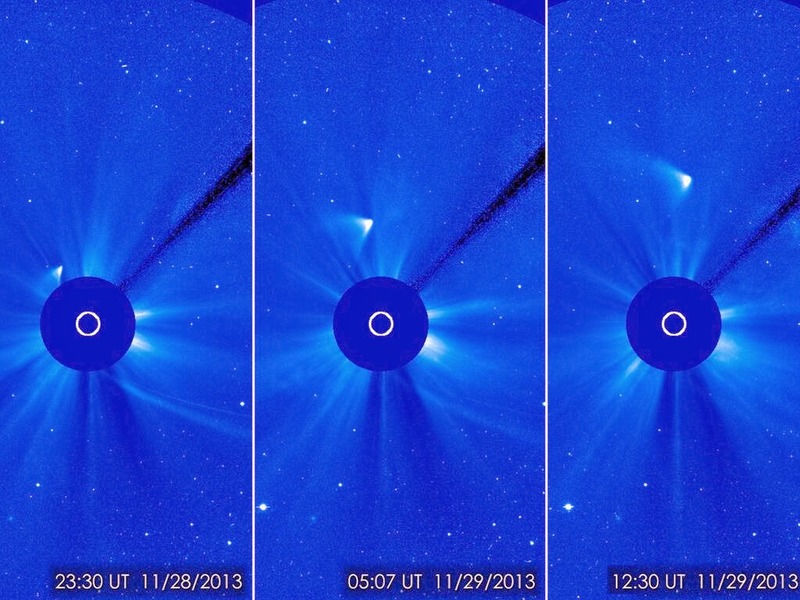 I feel confident that Comet ISON has been destroyed by its close encounter with the Sun. There will not be anything to see in the morning sky in early December. Comet may be falling apart but not yet known for sure......has passed closest to the Sun and is now headed out. Be sure to tune in to the events below to watch astronomical history as it happens. Comet ISON is racing towards the Sun for a Thanksgiving Day rendezvous that will be at its closest point - 730,000 miles - at approximately 1:37 p.m. EST. What becomes of the comet will not be known until something actually happens. Comet ISON has been quite an enigma since it was discovered last year and the buzz of the astronomical community. With a fleet of solar spacecraft watching the comet as it approaches and passes the Sun, coupled with the power of the Internet, earthlings will have a ringside seat. NASA will host a Google+ Hangout on the Internet from 1:00 p.m. to 3:30 p.m. EST featuring astronomers and views of Comet ISON in almost live time. NASA television and the agency’s website will also be carrying this event. You can tune in here https://plus.google.com/events/c8t7i5dbr1k50oq89giloiqe8rc. If the comet survives its close encounter with the Sun the big question then becomes “will it be visible to the viewing public?” Once again, we will not know the answer until the comet has passed the Sun. If it looks like Comet ISON will be visible I will post some links and finder charts so our readers and listeners can try to see it in the morning sky before dawn. Stay tuned and tune in on Thanksgiving Day! Just got back from sea today. Comet ISON is counting down to closest approach set for the 28th at 2 p.m. EST. Doing some media segments and will post more tomorrow on where to tune in for the events on Thursday. 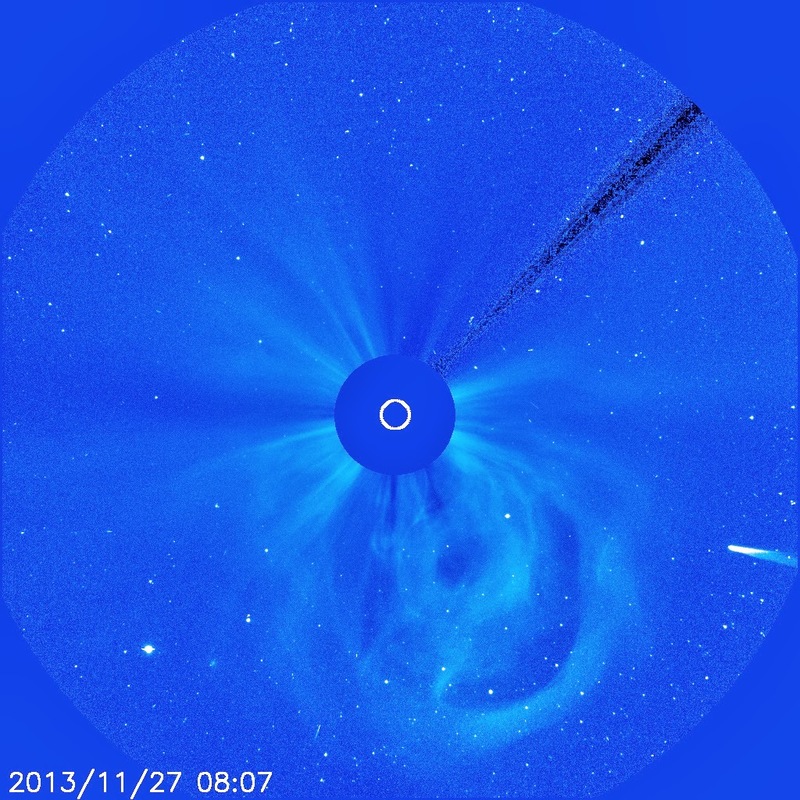 Comet ISON, the pristine comet from the vast reservoir of comets called the Oort Cloud, is headed for a close encounter with the Sun on November 28, Thanksgiving Day, at 2 p.m. EST. Each passing hour brings the comet inexorably closer to the Sun due to the pull of the Sun’s gravity. The ultimate fate of the comet may well be determined by its solar rendezvous but as the well known phrase of cometary studies says, “Comets are like cats; no one knows what they will do”. At its closest approach to the Sun Comet ISON will pass only 730,000 miles from our star and will be traveling at 864,000 miles per hour. The comet will be subjected to heating at 5,000 degrees F and gravitational forces that could tear the comet apart. No one knows what Comet ISON’s fate will be but astronomers around the world will be watching and waiting to find out. Comet ISON was discovered last year and because it was so far away when sighted, media speculation flourished as to it becoming the “Comet of the Century”, “bright as the Full Moon” and “visible in daylight”. As time progressed the comet did not live up to brightness predictions and the real possibility of a cometary dud for the viewing public arose. Comet ISON has come to life in the past week and brightened to naked eye visibility although it has been necessary to know precisely where to look. I tried to look for the comet while crossing the Atlantic Ocean aboard ship but could not see it. 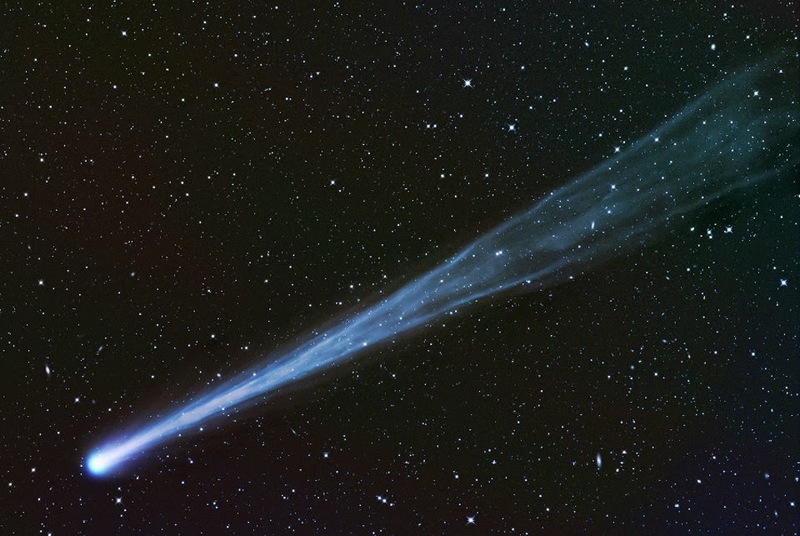 The comet’s tail, caused by the sublimation of gases and dust from the comet’s solid nucleus due to solar heating has become quite a sight in photographs. The tail has lengthened considerably in the sky and developed complex structure. Comet ISON is diving in to the glare of the rising Sun and will probably be no longer visible after the 25th or 26th to ground based observers. The good news is that a fleet of solar spacecraft will be watching Comet ISON as it approaches and recedes from the Sun so the world will have an almost “live as it happens” view. What makes Comet ISON of extreme interest to the astronomical community is the fact that it has never been to the inner solar system before and that it will pass so close to the Sun. Both of these factors combine to provide an opportunity to observe and learn about a comet that is an unaltered left over from the formation of our solar system 4.5 billion years ago. The close solar encounter will provide information on the comet’s structure and composition which will complement the myriad of observations already made as well as those yet to come. Observations of Comet ISON have been conducted with ground and space-based assets since its discovery. Even spacecraft at Mars observed the comet when it passed by the Red Planet in October. Hubble Space Telescope (HST) has been providing observations to show that the comet has not fragmented as some scientists had predicted would happen before Comet ISON passed by the Sun. 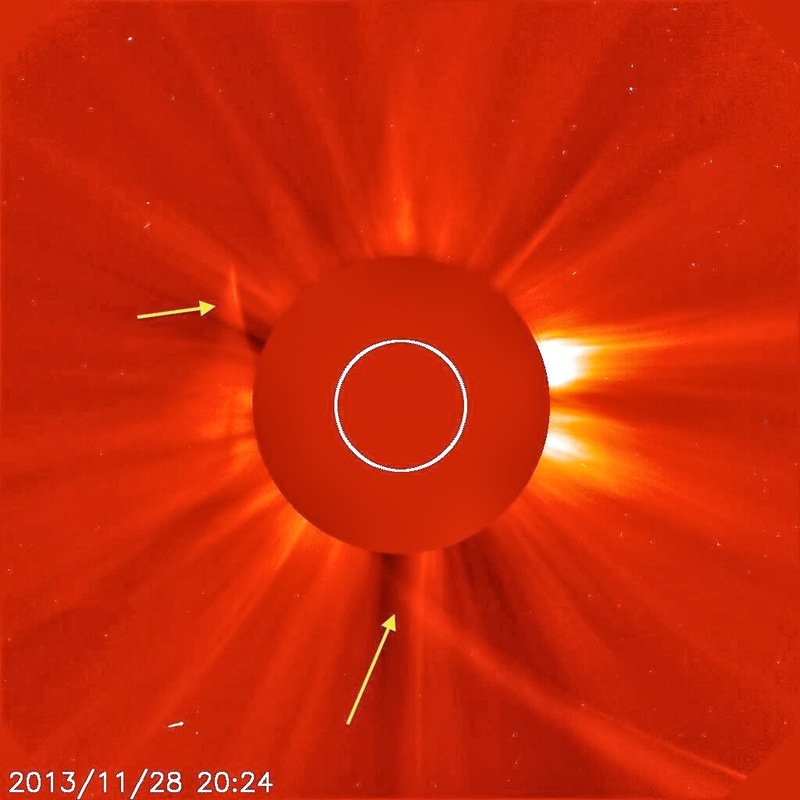 Comet ISON is already being observed by NASA’s STEREO solar spacecraft with two others, Solar Dynamics Observatory (SDO) and Solar Heliospheric Observatory (SOHO) waiting for the comet to enter their fields of view. A Japanese spacecraft will give us our best view when Comet ISON passes closest to the Sun. No one knows what will happen to Comet ISON when it encounters the Sun up close and personal. We do know however that our knowledge of comets will be greatly enhanced by all of the data accumulated on Comet ISON. 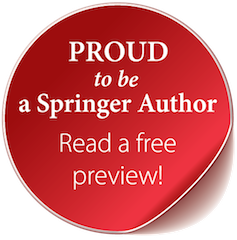 If the comet becomes a viewing spectacle or suffers a destructive end, you will read about it here. I had fair skies here in the Bermuda Triangle but could not see Comet ISON this a.m. I had no optical aid and I think that makes a big difference in zeroing in the comet. The countdown to the Sun is ticking away for the comet and we will be watching what happens. It is still not known how COmet ISON is going to appear as it gets close to the Sun and afterwards. We will have to wait and see but it IS a beautiful comet now. MAVEN launched on time today 11-19-13 and is headed towards Mars. NASA's newest mission to Mars, Mars Atmosphere and Volatile EvolutioN (MAVEN) , is set to launch on November 18th. Launch is set for 1:28 p.m. EST and there is 60% chance of favorable weather. 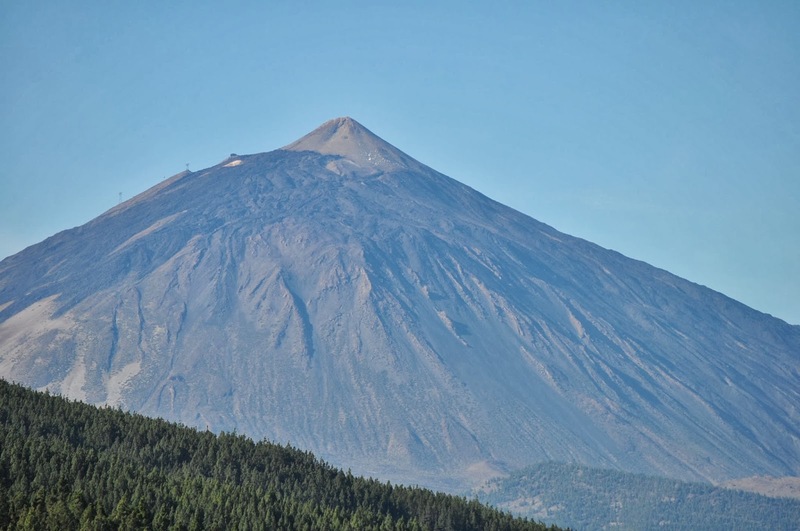 Seeing this dominating seamount volcano at over 12,000 feet high makes me wonder what Olympus Mons, the largest volcano in the solar system and on Mars would look like. Learn about NASA's latest mission to the Red Planet - MAVEN (Mars Atmosphere and Volatile Evolution) - which is set for launch on November 18th. Here is a link to learn the latest on habitable zone exoplanets that are similar in size to Earth. These are planets where liquid water can exist as the planet lies in the zone around its star that allows for liquid water. The study finds that this is a fairly common happenstance in our Milky Way Galaxy with tens of billions of such planets. Want the best information on what Comet ISON may or may not do in the weeks ahead to Thanksgiving Day (11/28/13) when it passes closest to the Sun at 730,000 miles, traveling at 864,000 miles per hour and being subjected to 5,000 degrees F and major gravitationally induced stresses? If you want to know about Comet ISON read ALL of the following blog entry and learn about the 3 possible outcomes for Comet ISON and the science being done and possible as a result of each outcome. You will also learn what it means for us being able to see the comet with the unaided eye. Congratulations to India for launching its first ever spacecraft to Mars. The launch is the easy part. Now we will see how the orbital insertion goes in September 2014. The eclipse was probably around 95% from our location at sea. Check out the photo bomb of my pinhole projection shot! Sky got dark and the shadows as you can see were very abnormal. 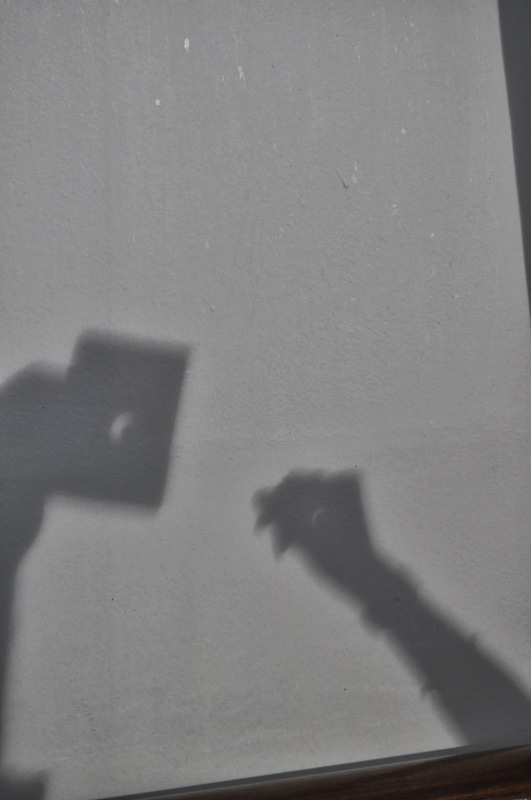 Deepest partial solar eclipse I have ever seen except for the moments before and after totality. I will be in a deep eclipse of perhaps 90+%. I will share with you tomorrow what occurred. Be safe, protect your eyesight by following the instructions in the Sky and Telescope article above.